What's the point of a Pinterest-perfect kitchen if it doesn't stay that way? 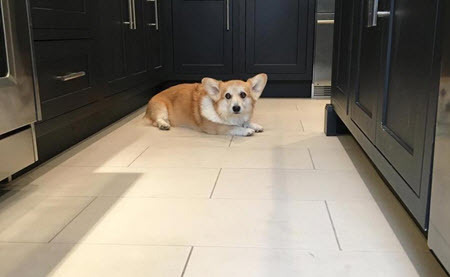 Kitchen surfaces, especially countertops, need to be able to take hit after hit. And these nine will. And look gorgeous doing it. 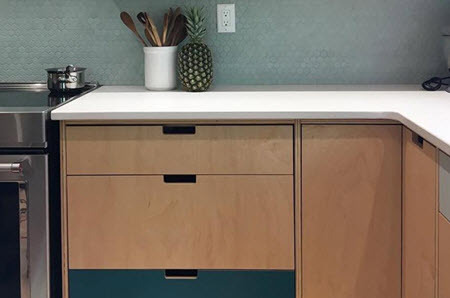 Don't worry — laminate won't make your kitchen look like great-grandma's lime-green tabletop. And it won't stain like hers either. This affordable and heat-, stain-, and water-resistant material has undergone quite a makeover. 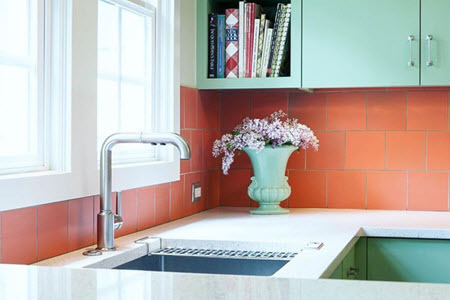 "The old stereotypes about the way it used to look aren't really as true anymore," says Ebony Stephenson, a certified kitchen and bath designer. In fact, with super-realistic marble and granite patterns, you can be in a kitchen with laminate these days and not even know it. What's more, laminate is now is available in 5-by-8-foot sheets, which means it replicates pricey granite, marble, or butcher block with fewer joints. That means fewer moisture problems, too. At the other end of the price spectrum, coveted quartz countertops carry a hefty price tag. But they also carry a pretty big promise: no maintenance — ever. "You don't have to do anything to it at all." Stephenson says. Yeah. In case you weren't aware, you're supposed to maintain other countertops. 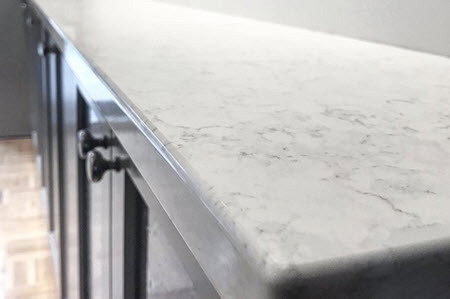 Unlike marble and granite, the manufactured quartz defies stains, mold, mildew, and bacteria with no sealing required. As "Consumer Reports" found, hot pots, serrated knives, and abrasive pads also can't mar quartz. And unlike stone, it doesn't even need a special (and pricey) cleaner. 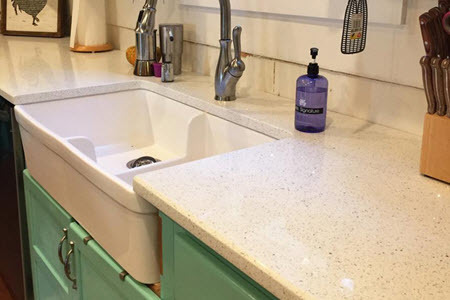 For an extra hardy variety, look for quartz composed of 93% or more quartz and 7% resins, says Adam Gibson, a certified master kitchen and bath designer based in the Indiana Design Center. They're more expensive, but less likely to chip or stain. We know what you're thinking: "Luxury … vinyl?" But it's more than just marketing spin. Today's luxe stuff has thicker layers that better prevent shoe scuffs, scratches, and tears. In fact, vinyl requires less care than linoleum, which is susceptible to moisture, and tile, which comes with dirt-catching grout. The sheets come in 12-foot-wide rolls, so in most homes, "you can cover the floor in one big sheet, with no seams," Stephenson says. 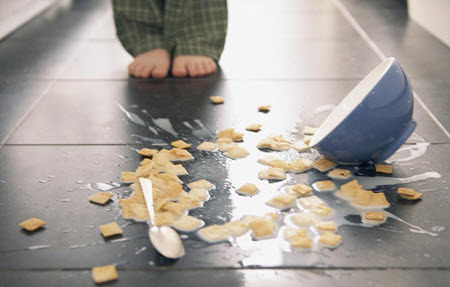 "It's very easy to sweep up since crumbs can't get stuck in cracks." Vinyl planks and tiles, likewise, are a snap to clean with a broom and mop, since they click tightly together. 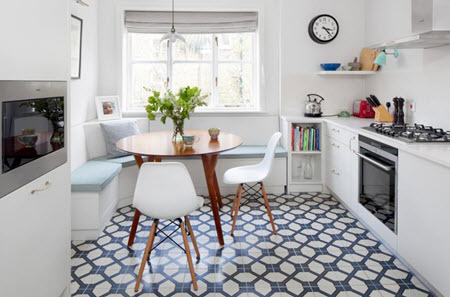 If you love the look of tile and grout (after all, it is a classic), glazed ceramic tile is a no-brainer. It will literally outlast you. It's immune to moisture, shrugs off stains and acidic foods, and simply wipes clean. The tiles offer endless design possibilities and don't require sealing, like stone surfaces do. The glazing pretty much does that. There are many types of glazed ceramic tile. Porcelain is the hardest and densest — making it the most impervious to moisture. 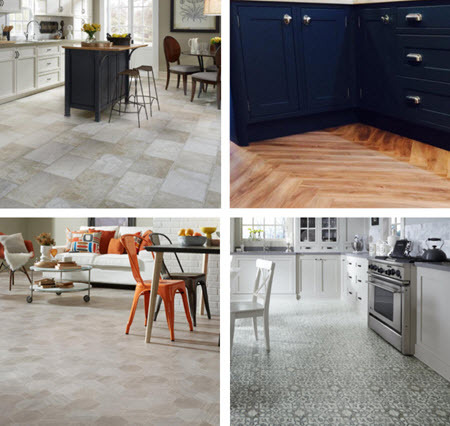 But with so many styles and colors to choose from, you can find a glazed ceramic tile you love, porcelain or not, that fits your budget — and will take a beating. Stainless steel may feel a bit, well, basic, but there's a reason it's always around. 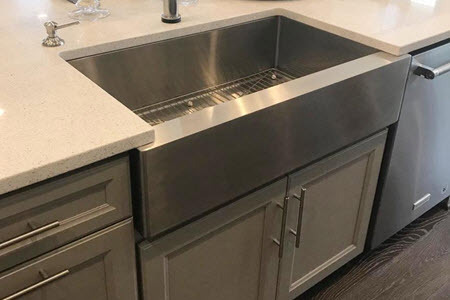 In addition to complementing both modern digs and country kitchens, it outperforms solid surfacing, acrylic, enameled steel, and cast iron in resisting stains, abrasions, high heat, and sharp impacts, like from a tumbling knife. Enamel can crack and chip, for example. Solid surfaces and acrylic are much more prone to scratching. Although the material has gotten a bad rap for fingerprints, they easily wipe away with a little lemon juice on a paper towel, says Dennis Gehman, a master certified remodeler. And given the choice between a chipped sink and one with an occasional fingerprint? Door No. 2, please. Can anything less than solid wood handle your heavy stoneware and frequent slams with grace? Yep, and it costs a lot less. Furniture-grade (literally, "grade A") plywood is composed of pressed layers of alder, birch, or cedar, which gives it composite strength (read: super strong). Plus, this fancy plywood won't irreversibly swell from moisture, like particle board can, and won't warp like solid wood. 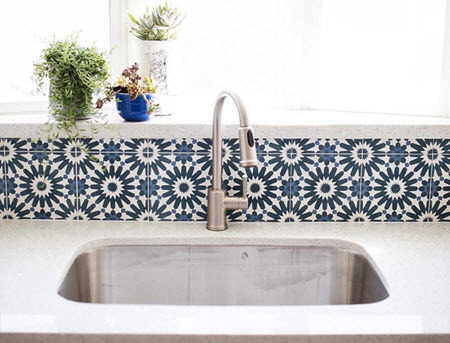 Just like with floors, glazed ceramic tile is great for a backsplash, but if you can afford a small splurge, choosing porcelain here is a wise choice — because it is the toughest surface. And your backsplash does take a beating — from splattered bits of tomato sauce to bits of cookie dough; it's where grease splatters the most. All that gunk will simply wipe off. The tiles also don't need to be sealed — ever — and they aren't brittle like glass tiles, so they're practically impossible to chip. And they happen to be gorgeous, so there's that, too. Sheets of this fire-resistant material have long proved their mettle in busy restaurant kitchens. The famously tough stainless steel won't corrode as readily as other materials when splattered with tomato sauce, for example, and doesn't have to be polished like brass or copper. Using a single sheet eliminates seams and makes cleaning — with just soap and water—that much easier. But that single sheet doesn't have to be flat and boring. 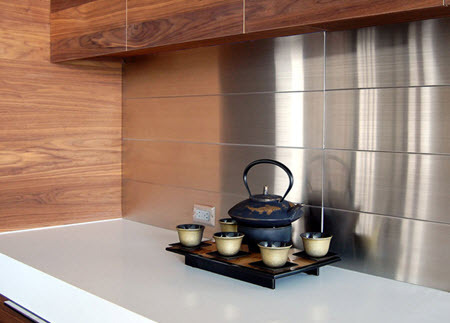 Stainless steel backsplashes come in fun, patterned varieties, including options that look like subway tiles from the future. A hardy faucet that can take a licking starts with a solid brass body, which can resist corrosion from hard water. When we say body, we mean the core material for the body of the faucet — not the plating, which determines the color. The valve matters, too. Ceramic disc valves will last years without dripping, whereas cartridge valves have seals that can wear out, and ball valves have more components — providing a greater chance that something will break. So check the box carefully when faucet shopping, or flag down a salesperson who knows their stuff to help you find the best pick. 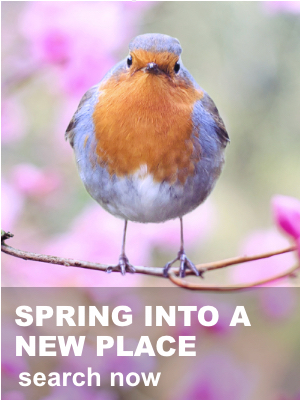 Amy Howell Hirt has written about home design for 13 years. Her work has been published by outlets including "The Home Depot," "USA Today," and Yahoo! Homes. She previously served as home and garden writer and columnist for "The Cincinnati Enquirer." Because...do you actually know the difference between a "quiet title suit" and a "quitclaim deed"? A growing number of Americans believe now is a good time to purchase a home as the real estate market heads into what is traditionally its busiest season of the year. Housing markets may not be as hot as previous years, but selling now could be your best bet.